Taking up an entire block, the Chicago Cultural Center is one of the city’s most popular and most visited attractions. This remarkable landmark building is home to two impressive Tiffany-stained glass domes. A unique blend of classic and modern, the architecture is both historic and beautifully unique, showcasing Mother of Pearl mosaics, and a Carrera marble lobby. 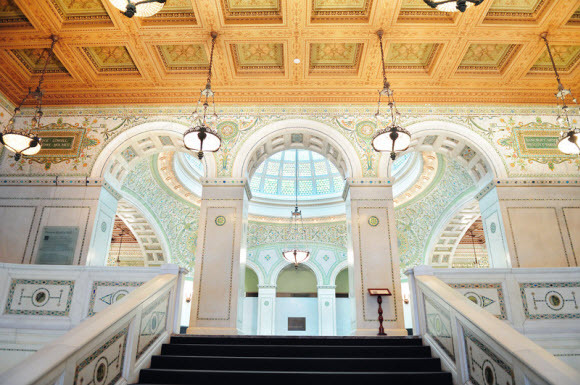 The Chicago Cultural Center presents numerous and a wide variety of free programs every year, including theater, film screenings, lectures, art exhibitions, music, dance, and family events. Here are just a few of the great free upcoming events. The powerful exhibit runs until January 12, 2014, highlighting the intense and exciting art from the Chicago Street Art community. The Paint Paste Sticker: Chicago Street Art exhibit will showcase the work from over two dozen artists and features an overview of projects by Chicago Urban Art Society & Pawn Works and Galerie F. Explore how the hard life of the streets inspired these vibrant works of art! Running from January 11 to February 1, OnEdge–an exciting new free series–will showcase a number of stimulating and diverse events including experimental dance and theater performances as well as a number interesting workshops from national and international artists. If you have a curious spirit and have a flare for the provocative, this one is for you! Taking place until mid-March, the Wright Before the “Lloyd” exhibit spotlights the original and innovative work of Frank Lloyd Wright. Considered to be one the greatest architects of all time, this intriguing exhibit also explores his earlier endeavors as an interior designer, writer and educator, as well as his many influences. Don’t miss out on this interesting and educational experience that the entire family will enjoy. For more information on event schedules and contact information, visit the Chicago Cultural Center website. While in town exploring the Chicago Cultural Center, our Chicago Midway Hotel offers visitors comfort, convenience and elegance all rolled into one. The Chicago Midway Hotel is conveniently located near the Midway Airport and is a mere eight miles from Chicago’s bustling downtown core.